While the mission team leader and his team are on the mission field in Central America, they will be assisted as they minister by an assigned CALMS' cultural helper--usually someone on CALMS' staff or a trusted Central American partner, who help guide the US team as they follow their mission plan and strategy developed prior to the trip in dialog with a CALMS' staff member. 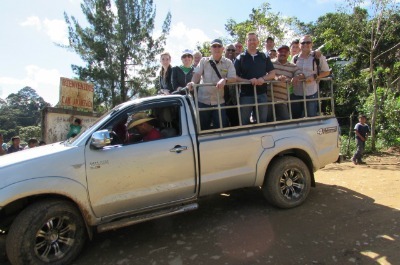 During their mission service, a CALMS' team will also be helped with translation and other tasks so that they can be successful in communicating and working with their Central American partners. Teams always work under the authority of and in partnership with local leaders in communities or institutions where they are assigned. For example, medical volunteers always register their credentials and serve under the guidance of a national health care provider. This policy protects the volunteers and shows respect to the host culture. While on the field, CALMS encourages daily team prayer, Bible study and reflection in order to help volunteers benefit from and grow spiritually through their mission experience. CALMS' GO! BOOK provides multiple options for team debriefing as well as maps, and other useful resources.